Althouse: Today is the 100th anniversary of the performance of Stravinsky's "The Rite of Spring" that caused a riot. You want to get yourself in pretty good shape before you try that thing with the shovel. I can see their ankles! Stravinsky. I was going to be a modernist composer, too, but I couldn't figure out how to put banging a trash can lid on piano guts to a paper score. It sounds about about the same, though. Stravinsky in 1963 (my photo). French audiences, to express contempt for new music works, would whistle the melody along with the music. The composer would retaliate by repeating the piece. Did someone shout out "Judas"? If you ever get a chance to see the ballet with Nijinsky's choreography, make sure you sit in the balcony where you can get a wide view of the stage. 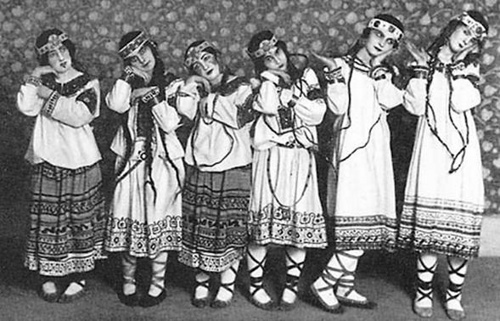 Nijinsky's genius lay in having multiple groups of competing yet complementary dancers on stage, a technique mirrored in Stravinsky's music by piling up repetitive motif upon motif. Nijinsky's choreography is as far from "Swan Lake" as is Stravinsky's music. Personally I like the score for "Rite of Spring", but I prefer what Disney did with it. In any event, it's no Sharknado! Think I'll make playing it on this date annual thing. 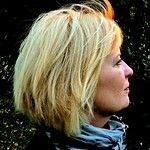 The bourgeois were right to riot against ugliness. In a musical biography of Stravinsky I read several years ago, the author detailed how the promoter deliberately planned the premiere to maximize the disruption, for instance by seating the most conservative older patrons right next to the most radical young firebrands. Basically, he wanted the furor for publicity purposes. Well, I personally was APPALLED! It's hard for me to imagine the music as shocking. But with all of the modernist classical music used in film scores, I think it's hard for most people. Is it harder to imagine having your memories stripped away than it is to imagine having experiences you never had? It's easy to remember the first time you experienced things, but what about things (like music) that have always been in the background? I have a hard time really putting myself in the place of an adult seeing something like a movie or television or snow for the first time. Hah! That's not even the worst thing to happen at a performance of a work by a great artist on a May 29th in a year ending with '13'! Today is the 400th anniversary of the burning down of the Globe Theater during a performance of All Is True (better known as Henry VIII). Maybe I should have written "a work partly by a great artist", since the play is half Shakespeare, half Fletcher. The big question is: Will Ann figure out what you meant without Googling? They thought THAT was trouble... And a year later, hello, Great War! All of a sudden, this Nijinsky guy is small potatoes. The Rite was the second piece that night. Top billed was Les Sylphides, a ballet that couldn't be more opposite from the Stravinsky/Nijinsky offering. The juxtaposition probably contributed to the disorder and catcalls (hardly a riot). Nijinsky was photographed in a Rite of Spring costume (as one of the elders, the guys with the hats) but he did not dance in the debut performance. This is a good experiment in the human brain's need to harmonize what it hears or sees with existing patterns of learned sounds and sights. New stuff always irritates folks. Give em that old time music, and do not let folk singers Go Electric. Re: "Did someone shout out "Judas"? The big question is: Will Ann figure out what you meant without Googling?" I am pretty sure the Esteemed Ms. A got the Reference. I would've Loved it to be Highlighted if only that the line was as Short and to the Point that I ever can Get. Brevity: the Absence of Run-on Sentences. About Scarlett Johansson Boyfriend Robot.